Genuine OEM Brother Toner Cartridge, Cyan, 1,400 page yield. 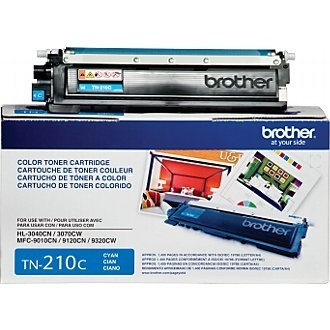 Brother part number: TN210C. Color Laser Toner Cartridge compatible with Brother DCP-9010, HL-3040CN, HL-3045CN, HL-3070CW, HL-3075CW, HL-8070, HL-8370, MFC-9010CN, MFC-9120CN, MFC-9125CN, MFC-9320CW, MFC-9325CW.